"I would like to start by offering my thanks to John Arena and the entire Public Ceremonies and Celebrations committee here in Concord for both inviting me to join you but, more importantly, for upholding this tribute to those to whom we owe so much in such a heartfelt and community-wide fashion. It is fitting for this town that saw our Nation’s very first battle for liberty. I would also like to acknowledge that the Department of Defense is commemorating the 50th Anniversary of the Vietnam War right now and it is a good time to specifically honor the memories of Edward Dalton, Thomas Dickey, Ricky Frank, Jay Sheehan, and William Emerson, five Concordians who lost their lives in that conflict. After years of neglect, a grateful nation is finally saying thank you to our Vietnam veterans. And I would just like to add that as much as we are here to honor the fallen please keep their families in mind, our Gold Star families, and acknowledge their loss. Every branch of the Armed Forces upholds a set of values; they are all pretty similar. 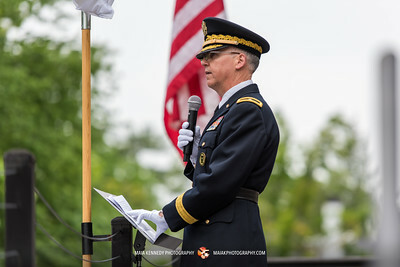 The Army Values (Loyalty, Duty, Respect, Selfless Service, Honor, Integrity, Personal and Physical Courage) are attributes that are deeply held in our culture. They are virtues that we all aspire to, with varying degrees of success, and by which we measure each other and in particular by which we measure our public servants and civic leadership. So it is only natural to ascribe success in combat, perseverance in the face of extraordinary hardship, and the hard won freedoms we enjoy to these honorable attributes we call the Army Values. But whether they stood their ground at the North Bridge, huddled in Valley Forge, slogged through Normandy or Guadalcanal or trudged the A Shau Valley, military people know that Soldiers, Marines, Airmen, Sailors, Coasties and even the often forgotten Merchant Marines, actually fight for each other. In moments of crisis they rely on each other for survival. One example of this unique love is Concord’s own Captain Tom Hudner, whose passing we recently honored. Captain Hudner was known throughout his life as an icon of integrity and valor. His commitment to serving our nation was unquestionable: he received the Medal of Honor and we have named a warship after him. You don’t get higher accolades than that. But on a winter day in 1950, when he intentionally crashed his plane on a frozen mountain deep in Korea, His valor, his courage, didn’t arise from national pride or a commitment to our foreign policy goals: he risked his life to save his wingman, Ensign Jesse Brown. In that he was closer in virtue to the book of John in the Bible; No greater love has no man than to lay down his life for another, than he was to the flag or the country. An extraordinary man who will forever be remembered for his willingness to sacrifice his own life to save his brother in arms. So today I want to avoid romanticizing war as we pay tribute to the Warriors who gave their lives for our freedoms. This turns out to be a bigger challenge than you may think. There is a remark often attributed to Samuel Clemens that makes the point, “history may not repeat itself, but it often rhymes.” So let’s talk a little history. In his book, The Wise Men: Six Friends and the World They Made, Walt Isaacson describes the evolution of our relationship with the Soviet Union. At first they are an invaluable ally in defeating the Third Reich at the decisive phase of World War Two. Then, as the closing days of the war produce a very unstable world stage, Isaacson describes Stalin as an opportunistic, self-interested, unilateral actor. And lastly, as the community of nations begins to rebuild and reorder that world stage, he describes an obstinate, expansionist hegemony that would quickly emerge as the greatest threat to our existence, let alone our National interests, for the coming decades. Where we fools to engage with the Soviets, blind to their intentions, or did we set our values aside in a pragmatic bid to bring an end to Hitler’s atrocities and bring peace to Europe? There is no simple answer to that question, in one regard it is a little from column A, a little from column B or all of the above. But by the end of the war many Americans were very enamored of the Soviets. Many appreciated their sacrifices and their assistance, and were angry at warnings to contain the Soviets. These divisions split along political lines, so there is nothing new under the sun there, and along economic lines, with industry giants advocating that broader world markets should include the Soviet Union. The era we live in now is often characterized as a nation divided and the lament that the political split is worse than ever before is frequently heard. But the fact is that divisive politics is a hallmark of our country going back to the days of our founders. And at the end of World War Two the arguments were vehement and the outcomes extremely consequential: how to manage the bomb, what to concede in Poland, we were actually debating whether or not Germany should be stripped of all industrial capacity and turned into an entirely agrarian society to assure they would never rise again. All while people starved and perished of disease throughout Europe. Those arguments, disagreements and debates over the future were not a sign of poor government. They were a purposeful, though difficult, reckoning with issues of tremendous consequence. We were right, just as we are right today, to reflect, argue, and debate on how we, as the greatest nation on earth, shape the world in which we live and for which we are often held accountable. It would be nice if we could do it with dignity and respect. And, on this Memorial Day, I would like to offer one other historical perspective on World War Two, one without parallel, to reflect upon. Depending on your source, or how the casualties are characterized, the number of United States service members to die in World War Two is 420,000 if you include the 12,000 Coast Guard losses and the 9,000 Merchant Marines who perished. Of those more that 290,000 were killed in action and of the 139,000 POWs held by our enemies, 23,000 never returned home. If everyone living in Concord, Bedford, Lexington, Lincoln, Arlington, Sudbury, Acton, Burlington, every man woman and child in Malden, Chelmsford, Wakefield, Maynard, Woburn, Waltham, and Weston, in short, if most of the people living in the greater Metrowest region were to die between now and the year 2021, you still would not match the loss of life endured by this nation in the roughly three and a half years of US involvement in World War Two. That is staggering to my mind and I hope we, as a people, would never tolerate a sacrifice on that scale ever again. I offer this sobering statistic because it is important to reflect on the balance, the tension, between our gratitude for the sacrifice of the fallen who we honor today and the just disdain for what it is we asked of them: to fight and die for our National Interests. I am far too pragmatic to think a day will ever come when our Armed Forces will be out of a job: we live in a volatile, uncertain, complex world full of ambiguous threats. But I do think that the best way to honor the sacrifice of past generations is to be judicious about what we ask of the next and to hold our civic leaders accountable as they grapple with consequential decisions concerning our national interests. He gave his life in the service of his country, but he fought and died for his fellow Marines. That is what I mean when I talk about a form of love that is higher than that of flag or country. In closing, I will say that your Army, and here in the Bay State, your Army National Guard, is as capable and ready to meet the threats of a tumultuous time in as volatile a world as we have ever seen. I am equally confident in my sister services. The pundits, politicians and talking heads who wring their hands over threats, budgets, and what other politicians have to say apparently do not know that the reason this Nation prevails in conflict is because of the Soldiers, Sailors, Marines, Airmen, and Coasties who serve every day. Service men and women who live by a set of values that run deep in our culture, but who fight and die for each other. Citizens, like Tommy Dickey, who forged a legacy of honor and sacrifice in harrowing combat experiences throughout our history. So we are right, in fact obligated, to pay tribute to those who perished upholding those virtues. But as we honor the fallen on this Memorial Day, let us also be mindful of the stark realities of war and never forget the extraordinary price paid by families, loved ones and our country. Thank you all again for allowing me to participate in this heartfelt tribute to those who sacrificed all for our security. It has been my honor." For full size pictures, click here.